Want to be updated on everything Throne of Glass?Visit the Throne of Glass fansite!CHAOL OR DORIAN?SAM CORTLAND, BICHES.I did not expect anything when I bought this book. All I knew was that it was a collection of five novellas that transpired before the events of Throne of Glass, and I'm reading it to make the wait for Heir of Fire more bearable. I especially did not expect to resemble a certain sponge after reading:The fact that Sarah J. Maas was able to break my heart with five novellas scares me, a lot. Throne of Glass is a six-book series and as of now (June 2014) there are only 2 books published, she has 4 more books which is a lot of time in the author world coming out and with the potential she's shown so far, I think I need to start packing up on tissues.Speaking of which, Ms. Maas, I have a gift for you:If you want to prepare for this book then read the Survival Guide to Assassin's Blade!Between these novellas and Throne of Glass, I'd say these give Celaena more justice. My favourite between the five would be Assasin and the Empire because of Sam Cortland and of course, the plot, the writing etc., but mostly Sam Cortland. Oh Sam *dreamy eyes* He blew my mind away and stole my heart in the process. Sam, I am rooting for you even if *cough* you know *cough* I'm still rooting for you!TO CELAENA AND SAM:THAT ENDING:WHY? WHY?! Why Sarah J. Maas?Sarah J. Maas, that was cruel.Absolutely cruel. I really enjoyed this! Some stories I liked more than others, but it was nice to see what happened to Celaena leading up to Throne of Glass. I would have liked to have seen more of her when she was younger and training, though.Now, on to rereading Throne of Glass! This was such a wonderful book. It is 5 prequel novellas, but the novellas read as one story with small gaps between the stories. I loved every second of it and I loved learning more about Celaena!Reread July 11-17, 2015 for #fivefavesI LOVE THIS SO MUCH BUT IT ALSO BREAKS MY HEART BUT I LOVE IT SO. BLESS SJ MAAS BLESS HER FOR THESE AMAZINGLY FLESHED OUT NOVELLAS. 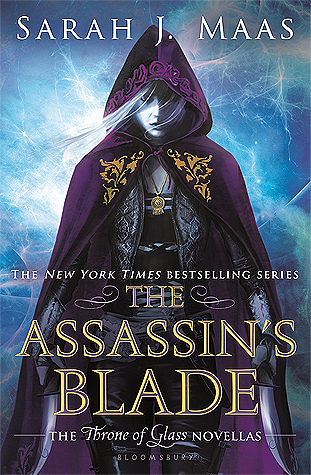 “My name is Celaena Sardothien,” she whispered, “and I will not be afraid.”The Assassin's Blade was a book I was nervous to go into. I have heard mixed reviews about The Throne of Glass series, ranging from people loving it to hating it which has resulted in me constantly pushing it back on my TBR. Thankfully, I was pleasantly surprised. I personally really enjoy Sarah J. Mass' writing. It is well done and engaging. Unfortunately, I did see a spoiler which meant that the ending of the last prequel wasn't a shock. Now, a lot of people will say that "oh well, it's in the first book" and I can understand that, but I haven't read the first book. So, it did matter to me. This bind-up features five novellas about Celaena and the events which lead to her being in the salt mines in Throne of Glass. I'm going to go more into detail about the novella's now since I don't think it's quite fair to just clump them all together. The Assassin and The Pirate LordRating: 4 Stars.“Her beauty was a weapon—one she kept honed—but it could also be a vulnerability.”The Assassin and The Pirate Lord was a great novella to start the bind-up. It is what leads to all the events that follow. It is ultimately the catalyst. We follow Sam and Celaena as they make plans behind their Master, The Assassin King's, back. The plans that are made are what result in everything to follow and shows the true colours of The Assassin King (who's name I can't remember how to spell). I thoroughly enjoyed this novella, it was full of badassery. The fight scenes were well described and painted a picture on what was happening while also setting up two of the main characters in the bind-up - Sam and Celaena. The Assassin and The HealerRating: 3 Stars.“There was such irony, she realised, in them working together—the assassin and the healer. Two opposite sides of the coin.”The Assassin and The Healer was the smallest novella in the bind-up. It was also probably the least interesting despite the insight into the fact that Celaena isn't the bad person she is made out to be. The story is told from the perspective of a healer Yrene and Celaena.I enjoyed Yrene's descriptions of Celaena, they painted the picture of her even more. For example, the following quote:“This girl wasn’t like wildfire—she was wildfire. Deadly and uncontrollable. And slightly out of her wits. "However, despite enjoying the characters, the bind-up was the most forgettable. It was a filler novella, overall, not adding much to the story and not being mentioned later. The Assassin and The DesertRating: 3.5 Stars.“Of course she was worthy. She was Celaena Sardothien, gods be damned.”In The Assassin and The Desert we follow Celaena through the desert to reach the Silent Assassins, somewhere she is going on an order from the King of Assassin's after he beat her unconscious for going against his orders. This novella, in particular, was interesting despite my lower rating - purely because I stopped a lot while reading it. I enjoyed watching the friendship form between Celaena and Ansel, Celaena learning that she can trust people. However, the trust is followed by the betrayal of (view spoiler)[Ansel (hide spoiler)]. I enjoyed the Mute Assassin and the whole kindness that he showed, (view spoiler)[like when he gives her the money to pay off her debt to the King of Assassin's. (hide spoiler)]I also loved the fact that to realise she had feelings for Sam, Celaena had to be taken out of the immediate situation. That is what made the next novella so good for me. The Assassin and The UnderworldRating: 4 Stars.“You want to know what price I asked for forgiving Arobynn, Celaena?”She slowly turned. With the ongoing rain, the hall was full of shadows and light. Sam stood so still that he might have been a statue. “My price was his oath that he’d never lay a hand on you again. I told him I’d forgive him in exchange for that.”The Assassin and The Underworld followed the growing relationship between Celaena and Sam. I enjoyed it thoroughly as the pair continued to bicker and argue, despite the obviousness of their feelings. I found the story in this particular a bit harder to follow, the names ultimately confused me and I again had to keep putting it down to do other things. I'm not sure what else to say about this particular novella, apart from the fact it included freedom and yet another betrayal from someone trusted. Though, this betrayal I was expected. The Assassin and The EmpireRating: 4 Stars.“The only secret I’ve borne my entire life is that I love you.” He gave her a slight smile. “It was the one thing I believed I’d go to the grave without voicing.” His eyes were so full of light that it almost stopped her heart.”The Assassin and The Empire was a bittersweet novella. Like I mentioned in the beginning of this review (view spoiler)[I knew Sam died (hide spoiler)] and the whole time I was just waiting for it to happen. It happened faster than I thought it would as well.The final novella is the story of how Sam and Celaena are trying to make a life for themselves now that they are free. They want to get away from the control of The Assassin's Guild (?) they are a part of, to start anew. Well, Sam does. Celaena is more reluctant to do so, and due to that reaction - ends with everything going south. I did enjoy this novella despite knowing where the ending was going to lead me. I expected the betrayal, yet again. It was hard not to see it coming, (view spoiler)[especially when The Assassin King kept popping up. (hide spoiler)]Overall, I'm glad I read this bind up before the first book. I read a review of someone about Throne of Glass and it was talking about how spoilt Celaena was. Now, that makes sense to me seeing as where she came from and luxury she was used to . I am excited to start the first book in The Throne of Glass series. It should be interesting at the very least. I absolutely loved these prequels to the 'Throne of Glass' series. Taking place during Celaena's years as an elite assassin working for her master, Arobynn, this grouping of prequels sheds a lot of light on the events that molded Celaena into the woman we met in 'Throne of Glass'. It is no wonder that she avoids relationships and entanglements. Her story was heartbreaking!Celaena spends her time trying to run from a past that haunts her, while simultaneously trying to gain the love and approval she lost when her parents were brutally murdered. Yet, despite her desperate need to feel loved, she is uncompromising in her values and sense of morality. This is probably my favorite thing about Celaena. She stands up for what she believes is right.Perhaps it is fitting, then, that it is her steely resolve that brings about her downfall. When she goes against her master, refusing to participate in his slave trade dealings, she sets off a chain of events that will bring her to her knees. Her brave actions may have solidified her unlikely alliance with Sam, a fellow assassin, but those same actions sealed her fate. By the time this chapter of her story unfolds, she will have lost the man she loved and her freedom.While I knew how this chapter of her story would end up, it was worth experiencing. Background information was shared that she'd new light on some of the events in the 'Throne of Glass' books. I read the first two books in the series before going back and reading these prequels. I'm glad that I did before I started the third book. I think this information will continue to be helpful to understand this complex, rapidly evolving series.I loved every minute of 'The Assassin's Blade'. I highly recommend this set of prequels if you're a fan of the 'Throne of Glass' series. I can't get enough of this badass female assassin! "My name is Celaena Sardothien and I will not be afraid. "Well, that quote just got a whole lot more meaning to it. I SURVIVED THIS BOOK! I was expecting a lot worse, honestly. I initially checked it out to see Sam since you hear so much about him in later books, but there really wasn't as much about him as I thought there would be. Or maybe I just braced for the worst. It's more about Celaena's twisted relationship with Arobynn than anything else. And THAT was enough to permanently mess anyone up. Her reactions and dependency on him were so sad, but really show how strong she becomes later. This book brought SO much insight to Celaena's character overall and I loved all of the stories (despite the sad). The second and third novellas were a bit slower, but I'm really hoping we see more of those random characters in Empire of Storms! This was my second time reading it and I'm not sure I got too much more out of it this time, but I do totally recommend reading it at least once! Maybe even before Throne of Glass or Crown of Midnight if you're just starting the series because it really does add a TON of depth to everything. The Assassin and the Pirate Lord- 4/5 stars Celaena and Sam take down a pirate lord, and we get a glimpse of how Celaena received her reputation as one of the most notorious assassins in the kingdom. She is ridiculously arrogant, but considering that I know she later goes through a major character transformation, I'll forgive her. We also see the bourgeoning feelings between Celaena and Sam develop D: It seems to me like Arobynn is already behaving a bit shadyThe Assassin and the Healer- 3/5 starsI appreciated this one for the girl power aspect, but it didn't really add anything to Celaena's overall story. I do like how in both of the stories we've seen a little bit of the compassionate side to Celaena. I want to see her do some more badass stuff though! And where's Sam? !The Assassin and the Desert- 5/5 starsThis story was interesting, definitely my favorite so far. It could've been a book by itself. I loved all the references to things we know from the books, and honestly, I'm hoping some of these characters will appear in the books :)The Assassin and the Underworld- 4/5 starsA little bit boring, but the ending made up for it. Celaena needs revenge ASAP but we all know how the next story is going to end :(The Assassin and the Empire- 4/5 stars We all knew that this was coming :(Also, I love how all these stories and characters become relevant in Empire of Storms. One of my biggest problems with short stories is that they just feel kind of pointless... I can't feel that drawn to the story in such few pages even if I already know the characters, so I'm glad SJM incorporated these stories into the main storyline! First read May 2015Reread August 2016Still hurts. I LOVE THIS DAMN BOOKI'm going to work my way through an entire reread of this series and I'm sooooo excited! I honestly forgot how much I love this book.